Metro officials planning the Downtown Regional Connector project held a media briefing on the project this afternoon as part of the run-up to the next round of public meetings on the project, which begin Friday. Click here to see dates and times. There was no dramatic news as part of the briefing. Much of what was said will be familiar to those who have been following the project, which would connect the Blue Line, future Expo Line and Gold Line, thereby allowing for more seamless travel on light rail into and through downtown Los Angeles. The project is in its draft environmental impact study phase. At this point, officials are still determining how the line would be built — whether it would be mostly at-grade, mostly underground or fully underground, meaning it would go under Alameda Street, an option that seems to be the most popular in the Little Tokyo area. *Some travel time estimates were provided — see the above slide. *Another benefit of the regional connector is that it will not only reduce transfers but reduce the need for passengers to pay for transfers. For example, at present a passenger in Long Beach traveling to downtown L.A. and then switching to the subway for the ride to the Civic Center would have to pay for two rides. The connector will reduce that to one ride. *Because of projected customer demand, the operation of the Gold Line would be truncated. Trains would travel north-south between Pasadena and Long Beach and east-west between Santa Monica and East L.A. Passengers traveling between Pasadena and East L.A. would need to transfer in Little Tokyo. It is important to note that this is a preliminary operating plan that could be subject to change, according to project manager Dolores Roybal-Saltarelli. The big impact of the above, in my view, is that passengers from East L.A. would need to transfer to reach Union Station, the region’s rail hub. If that bothers you, then bring it up at the community meetings. *That said, officials say trains could be running as much as every 2.5 minutes, meaning the transfer in Little Tokyo — basically just a walk across the platform — would be a relatively quick one. What’s next? This slide below shows. 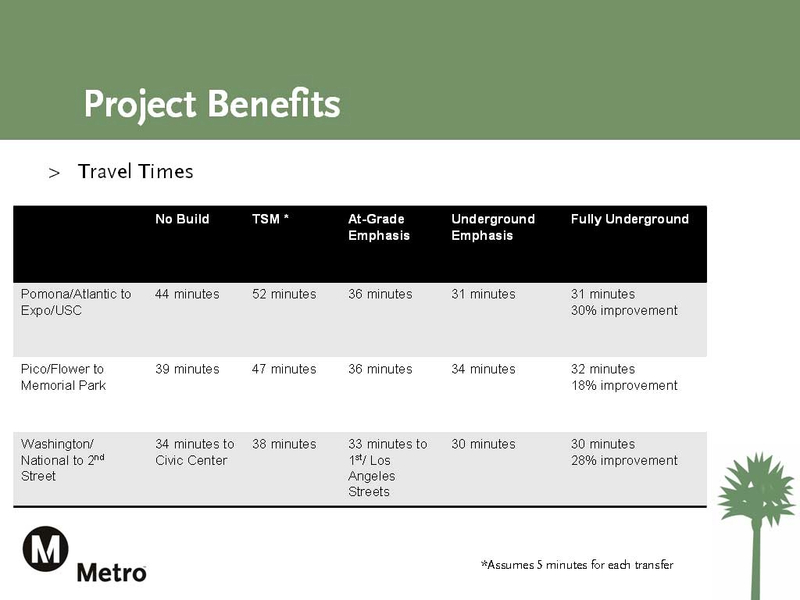 In other words, the project planning phase is moving right along and Metro officials are scheduled to make a recommendation on how the line should be built later this year. 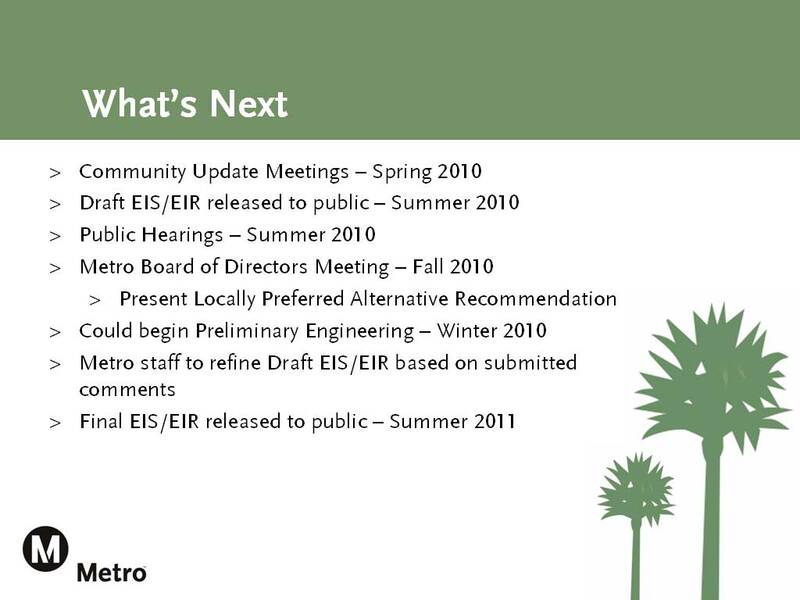 Under the long-range plan adopted by the Metro Board of Directors in October, the connector would be completed in 2019.